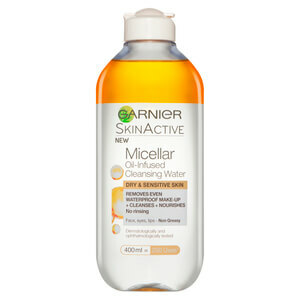 Cleanse and refresh your skin with Garnier Pure Micellar Cleansing Water for combination to oily, and sensitive skin. Gentle and dermatologically tested, the makeup remover washes away daily grime and makeup whilst soothing the complexion in one easy step; skin looks and feels clean and fresh. Perfume free and hypoallergenic, the purifying cleansing water is gentle enough for use around the eyes and lips. No need to rinse. - K.N. Combination to oily, and sensitive skin. Aplique o produto num disco de algodão e limpe o rosto, os olhos e os lábios. A Água Micellar de Limpeza Pure Active vem num formato generoso de 400 ml que permite usar 200 vezes. Aqua / Water, Hexylene Glycol, Alcohol Denat., Disodium Cocoamphodiacetate, Disodium EDTA, Poloxamer 184, Polyaminopropyl Biguanide.